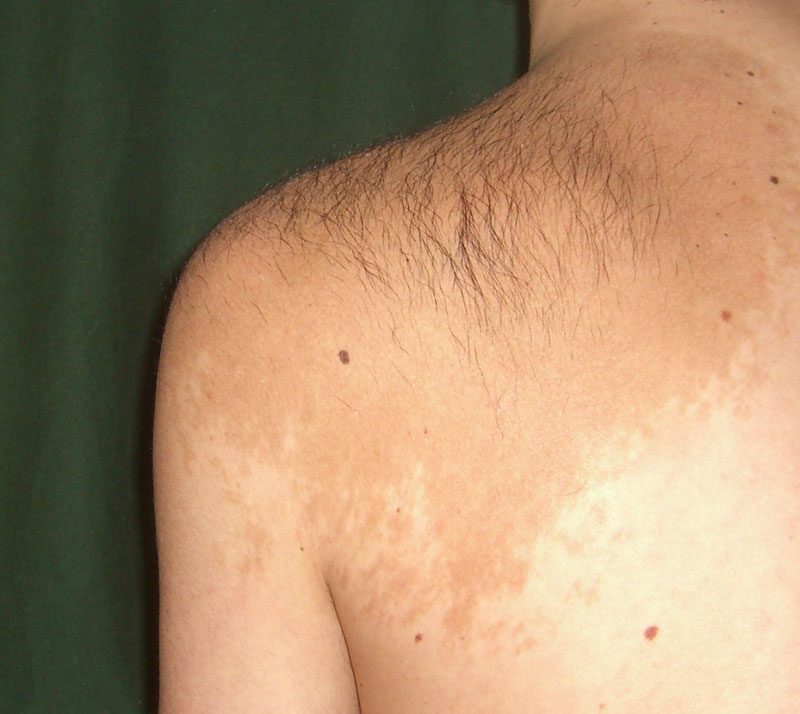 Becker’s nevus is an uncommon (but not rare) benign skin lesion. “Nevus” is another word for a mole and as such this growth appears as a very large and irregularly shaped mole. Which can be present at birth but most appear in puberty. The most common effects appears on the skin of the upper arm, chest, and/or back and can become quite large . It first arises as a flat patch of slightly hyperpigmented skin which will the slowly enlarge and develop irregular edges, often with thickening of the skin and excess dark hair growth. When examined under the microscope an overabundance of superficial skin cells, hair follicles, and melanocytes (pigment producing cells) is seen. It is important to note, however, that a becker’s nevus is completely benign – studies have shown it does not lead to cancer nor does it increase risk of developing cancer. Once this lesion has reached its full size (usually in young adulthood) it will very slowly begin to fade. Treatment is not necessary but is often desired as some may find the patchy darkened skin and excess hair growth unpleasant. Fortunately, much can be done to alleviate its appearance. Relatively new (and constantly improving) laser technology allow dermatologists to progressively lighten the darkened areas and reduce hair growth. While complete resolution of the area is rare, almost everyone treated with this method can expect a significant improvement. Many people chose to get a tattoo over the effected area and shave it periodically. While becker’s nevus is benign it can initially appear very similar to the deadly malignant melanoma. All new and persistent skin lesions should be evaluated by a dermatologist to rule out this disease, especially new dark areas with irregular borders. If you or your child suffers from symptoms of becker’s nevus, schedule an appointment with your dermatologist for prompt evaluation and treatment.